Rather download and print your warranty cards? CeCure Chimney Systems, LLC (CeCure) warrants to you (the “Purchaser”) that for the period set forth below the HeatShield Cerfractory Flue Sealant, when used to restore an otherwise sound masonry chimney’s ability to contain and convey the products of combustion to the outside by repair of mortar joints between clay flue tiles and/or resurfacing of chimney interiors when used exclusively for residential natural draft appliances to be free from defects in material or manufacturer’s workmanship. This warranty shall apply to you (the “Purchaser”) for your lifetime, when used to repair and seal defects in otherwise sound masonry chimneys that service UL listed residential solid-fuel-fired appliances, Category 1 residential gas fired (Natural or LP), and Type L vented oil-fired appliances, provided that you continue to own your home where the HeatShield Cerfractory Flue Sealant was originally installed. In all events, if you (the “Purchaser”) sell your home, (CeCure) will honor the warranty for a period of 5 years from the date of purchase. 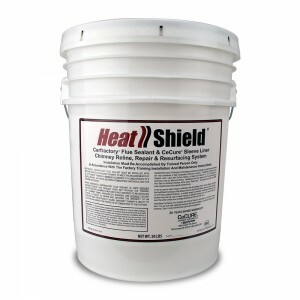 The HeatShield Cerfractory Flue Sealant warranty is subject to the following conditions: 1) installation must be accomplished by a trained installer; 2) installation of the material must be done in accordance with manufacturer’s written installation instructions; 3) the repaired chimney flues must be cleaned (plastic flue brushes only) and inspected on an annual basis (i.e., at intervals of no more than 12 months each commencing from the date of purchase) by a Factory Trained HeatShield Dealer, (except for the first inspection which can be at an interval of no more than 18 months from the installation date), who must initial and date the appropriate section on the reverse side of this card upon completion of such yearly maintenance; 4) corrosive chimney cleaners must not be used; 5) driftwood, wood or wood pellets containing salt, preservative treated lumber, plastic, or household trash must not be burned in the appliance or fireplace connected to the chimney that has been repaired with the HeatShield Cerfractory Flue Sealant; 6) the chimney must have a chimney (rain) cap; 7) In the case of a chimney fire, the repaired flue must be inspected and approved by a nationally certified chimney sweep or other qualified chimney professional before reuse. You may make a claim under this warranty by giving notice to your HeatShield Cerfractory Flue Sealant installer and having them provide information about your claim to CeCure. Upon approval of your claim, CeCure shall provide new material to you as your exclusive remedy. Neither CeCure nor the installer of the HeatShield Cerfractory Flue Sealant shall be liable for any removal or installation charges or for any special, incidental, or consequential damages in any way relating to, or arising out of, defects in, or damage to, the HeatShield Cerfractory Flue Sealant or the chimney flue to which the HeatShield Cerfractory Flue Sealant has been installed. This warranty gives you specific legal rights; you may have other rights which vary from state to state. Some states do not allow the exclusion or limitation of incidental or consequential damages, so the above limitations or exclusions may not apply to you.